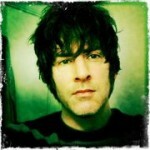 Marc Doty is a songwriter, composer, and synthesist from Washington State. His obsession with Moog and other vintage analog synthesizers led to him the creation of a synthesizer demonstration YouTube channel which now has nearly 4 million views. His video work as well as his passion for the work of Robert Moog, synthesizers, and the history of electronic music has resulted in the Bob Moog Foundation bringing him on as “Artist in Residence” for one month this summer. Marc will be using his visual and videographical skills to aid the Bob Moog Foundation in various projects including developing materials for the MoogLab curriculum. You can see more of his synth education work at http://www.youtube.com/automaticgainsay. Hi. I’m Marc Doty. When I was 8, it was my plan to be an astronaut. Unfortunately, there was a devastating complication: I get dizzy easily. A family friend pointed out that a person who got dizzy easily simply couldn’t be an astronaut. I was crestfallen. I think the indication of the trauma of this terrible news is that I, instead, careened off down a life path wholly comprised of making noises. While certainly not as lucrative as astronauting, such a life path has been quite rewarding. But it has never been quite so rewarding as it has been in the first few days that I’ve been working for the Bob Moog Foundation. It feels like my education, my musical experience, and my synthesizer obsession has been leading up to this. I’m going to be blogging about all of the incredible things that are happening, and all of the incredible things I’m doing to help promote the mission of this agonizingly worthy foundation. In 1977, my brother dragged me into his room to listen to the song “Jungle” by the Electric Light Orchestra. I thought it was amazing. I seized the liner notes and sat there clutching them as I read and pondered such exotic words as “Minimoog (spelled “Mini-Moog”) and “Polymoog.” What is a “Moog?” What does it do? Why is it so important that this band listed it by name? This was a seminal pondering, and my life would never be the same after it. 34 years later, I found myself clutching a different document with the word “Moog” in it. 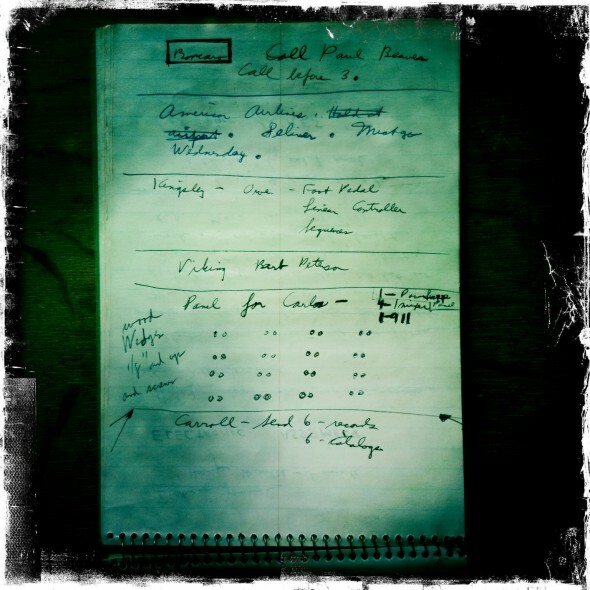 Not some flashy record sleeve from a famous band, but rather a simple, modest notebook filed with handwritten notes. If I were to hand this notebook to the average person, they would undoubtedly find little value in it. It contained lists of names, dates, and some relatively technical jargon relating to scientific equipment. Something like this could probably be found it just about anyone’s grandfather’s desk. These were just the notes of a businessman regarding the product requests and specifications of his clients in regard to the product he designed. Despite the general accuracy of that description, it is also the understatement of the century. More accurately, It is a written documentation of who bought what when from a burgeoning musical instrument company which was poised on the edge of changing the face of music. It is a modest, handwritten history of the progression of an instrument, the ideas of the designer, and the desires of the musicians who introduced it to the world. and by doing so, changed it. holding Bob Moog’s handwritten description of the origin of my obsession. History is literally tangible. In thinking about this, I realized how rare it is that we possess such detailed documents regarding the invention of a viable, versatile, and expressive musical instrument. While the exact history of the development of so many other instruments is lost to time, in regard to the Moog synthesizer (and most others since then, for that matter), we’re covered. The Bob Moog Foundation’s archives are large, extensive, and a living record of and testament to the amazing skill and talent of the creator of the modern synthesizer. And that’s one of the reasons that the Bob Moog Foundation is so important for obsessive instrumentalists and enthusiasts like myself, as well as the music community as a whole. Its charge is to keep and protect the extensive documents which portray the invention of one of the most revolutionary musical instruments ever created. That kid holding a record sleeve in 1977 and I are going to have a lot of incredible Moog-related surprises in the next month. For that, we’re both very thankful. 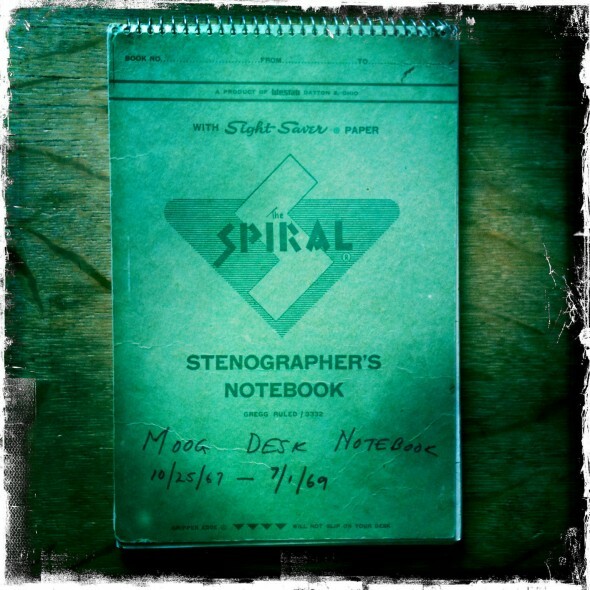 Marc,what an honor to be able to hold a Moog notebook! Small world indeed – in 1977 I also held ELO’s record sleeve pondering over what a Minimoog was – because I knew I loved that sound. My father had ‘Switched on Bach’ and a number of other Moog fueled records. Hope you enjoy your stay in Moog-land. Keep up the great work on your “automaticgainsay” channel! amazing. thanks for sharing this. its crazy to see how early those artists were down for obtaining some moog in their lives; these heavyweights mustve all had similar visions of the endless possibilities this new type of instrument would allow. real dope. respect to the bob moog foundation and good luck with the mooglab development as well.